Game is open to residents of England, Scotland, Wales and the Channel Islands who are 18 years or over. Not open to residents of N. Ireland or Eire. Employees and agents of the Promoter, or any third party connected with the production/ distribution of the newspaper may not take part, nor may their family or households. By taking part you are deemed to accept and be bound by these terms. 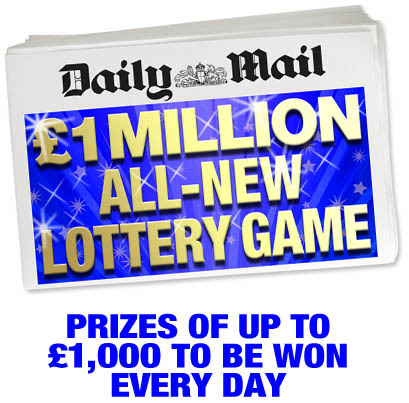 For full game instructions and prize details, see the Daily Mail or Mail on Sunday. PRIZES: If you match full lines of two-digit numbers in the Daily Grid with your Unique Number on the back of your newspaper, you may claim the associated prize. Unclaimed prizes will not roll over to the following day. HOW TO CLAIM: You may only claim once per day. Call 0345 0712 722 between 9.30am and 5pm (BST) (11am and 5pm on Sundays and Bank Holidays) on the day you match your numbers. CLAIMS AFTER THIS TIME WILL BE VOID. You must retain the original copy of your winning newspaper and follow our instructions to verify your claim. All entries must be available if requested for verification of any claim. Newspapers which are mutilated, illegible, forged or tampered with will be void. Photocopies not accepted. No responsibility is accepted for entries damaged, lost or mislaid. Proof of posting is not proof of delivery. MISSING UNIQUE NUMBERS: In the unlikely event there is no Unique Number on your newspaper, do not telephone. You can generate one via your MyMail account or alternatively, enter the monthly £1,000 draw. Write your name and address in the blank panel on the back page of your newspaper and send it to: Daily Mail All-New Lottery Game, PO Box 595, Blackburn, Lancs BB2 9JN. GENERAL: The Promoter’s decision is final. No correspondence will be entered into. The Promoter reserves the right in its reasonable discretion: (a) to disqualify any entrant whose conduct is contrary to the spirit of the terms and to declare as void any claims based on such conduct; and (b) to declare as void any claims resulting from any printing, production or distribution errors whatsoever or where there has been error(s) in any aspect of the preparation for or conduct of the Promotion materially affecting the result of the Promotion, number of claimants or the value of claims . (c) to add to or to waive any rules on reasonable notice; and/or (d) to cancel the promotion or any part of it at any stage in the event of circumstances beyond the Promoter's reasonable control. (e) in the event of there being more claimants than prizes available, the names of the valid claimants will enter a draw for the relevant prizes. Publicity may be given to winners and their names and images may be published in the newspaper and on our website(s). Winners must co-operate fully for publicity purposes. The name and county of the prize winners will be available within one month of the publication date by submitting a written request to the Promoter. If any of the provisions of these terms is held invalid or unenforceable in whole or in part that part shall be severed from these terms and the validity of the other provisions shall not be affected. These terms shall be governed by English law and any dispute shall be subject to the exclusive jurisdiction of the English courts. Promoter: Associated Newspapers Limited, Northcliffe House, Derry Street, London W8 5TT.